Harley and Ivy Meet Betty and Veronica #1 Review – AiPT! While it sounds as far-fetched as the DC Comics/Looney Tunes crossovers, this comes together in a funny, surprisingly organic way for the characters. DC Comics loves crossovers and it seems inevitable that Harley Quinn would finally star in one. Harley and Poison Ivy are heading to Riverdale to wreak havoc and meet Betty Cooper and Veronica Lodge in Harley and Ivy Meet Betty and Veronica. Thankfully, writers Paul Dini and Marc Andreyko have figured out an organic way to bring the group of characters together in a very funny first issue of this six-issue mini. Free college tuition for all Riverdale residents?! That’s the plan–after the town drains the wetlands that lie between it and Gotham City and then builds a new campus. The only snag? A certain botany-obsessed super-villain. When Poison Ivy enlists her bestie, Harley, to kidnap both Veronica Lodge, daughter of Riverdale’s most important citizen, and her friend Betty, she’s counting on some assistance–and the mayhem that ensues will probably work as well! While Dini and Andreyko could have just made Riverdale a stop on a Harley road trip, they found a great way to get the two Batman villains to the all-American town. Ivy hears that Veronica’s super-rich father Hiram Lodge plans on building an upscale college and shopping center on the site of Riverdale swamp. She can’t have that, so she pitches her idea to save the ecosystem. Hiram won’t have it, and Ivy decides to kidnap Veronica. The Betty and Veronica plot is your typical story, almost ripped right from a classic Betty and Veronica issue. Ronnie’s dad is also planning a costume party, and she cons Betty into volunteering for the party. While this certainly isn’t as exciting or interesting as what’s going on with Ivy and Harley, it is necessary for this crossover to work. Plus, it provides a hilarious montage with Betty and Veronica getting dressed up for the party. Let’s just say there are a lot of DC Comics in-jokes in there. And it all builds up to the moment our two duos meet. The writing on the series so far is great, and it helps to have Dini behind the pen. He not only co-created Harley with Bruce Timm but also came up with the idea of pairing her with Poison Ivy for Batman: The Animated Series. He figures out some way to make sure there’s a joke in every little Harley word bubble. But once again, the way Dini and Andreyko get Harley and Ivy to Riverdale feels is authentic. They aren’t just stopping by to say hello or to randomly disturb the peaceful world of Riverdale. Poison Ivy always gets angry whenever someone threatens an ecosystem. This time, it just so happens to be in Archie’s world. As for the art, it’s by DC Bombshells regular Laura Braga. Her work on Bombshells was great, but she has a little bit of an issue with drawing younger female characters. Thankfully, she didn’t draw the Riverdale characters in the style of the classic Archie stories, but her Betty and Veronica don’t look like high school kids. The strongest part of Harley and Ivy Meet Betty and Veronica is the writing so far. Dini and Andreyko’s dialogue is overflowing with jokes. They’ve figured out a fun way to bring these two unlikely duos in a way that doesn’t feel forced, something done as a marketing ploy or just to give Amanda Conner an excuse to draw a cover with Harley, Ivy and Archie. 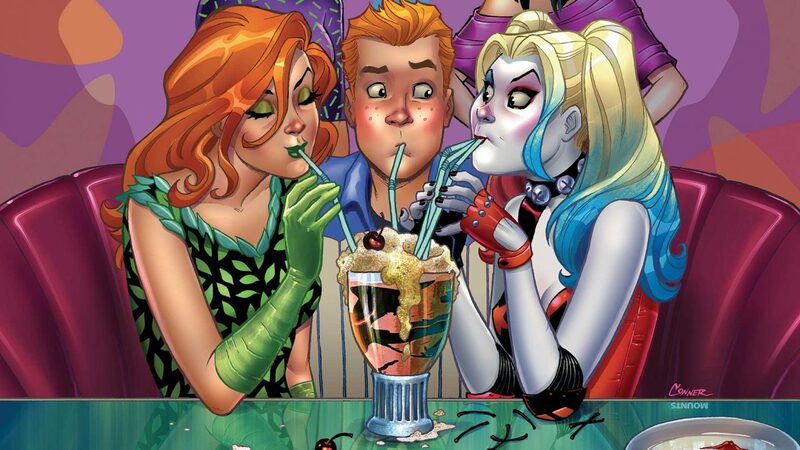 Harley and Ivy Meet Betty and Veronica sounds as far-fetched as the DC Comics/Looney Tunes crossovers, but this comes together in a funny, surprisingly organic way for the characters. Wonderful jokes from Dini and Andreyko. The writers came up with a believable excuse for Harley and Ivy to visit Riverdale. Some of the stuff with Betty, Veronica and other members of Archie's cast feel a little slow, like filler to beef up the first part before they meet Harley and Ivy. Laura Braga's art is mostly excellent, but her Riverdale characters don't exactly look like teens.